Real Estate Investors, Brokers, and Buyers may perform their due diligence on a property being offered with the information provided in each Newsletter. The Sale Notices are published each week in Smith County Legal News as they are filed of record. Insurance Agents will benefit from the Foreclosure Notices as they will become aware of a Policyholder that may or may not be occupying the property and the occupancy status may need to be changed. Typically a property in foreclosure may be abandoned, rented, or left vacant for a period of time in the event the Beneficiary (noteholder, bank, etc.) redeems the property in default. The Foreclosure Notices are a value to homeowners that may be affected by a neighbor’s property falling into default and potentially abandoned or vandalized. Tax Sale Notices are popular with Landowners that may have adjoining property and would be interested in purchasing at the Sale usually at a discounted market value. 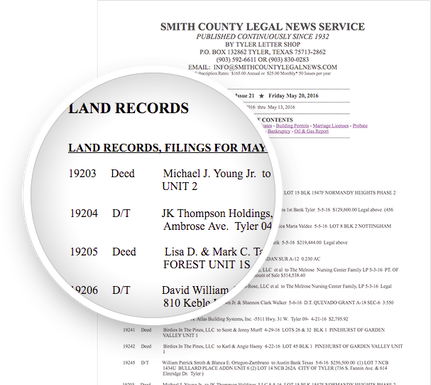 Smith County Legal News is an online list of valuable new leads, published weekly. It contains lists of foreclosures, bankruptcies, new businesses, marriage license applications and more, all issued in Smith County, Texas.